We've all been there. Maybe you're there now. Stuck in the proverbial RUT!!! I have been feeling like I'm stuck in that rut lately, and I know it is up to me to get out of it. So I have been writing down things I want to do now, in the short term future, and in the long term future. 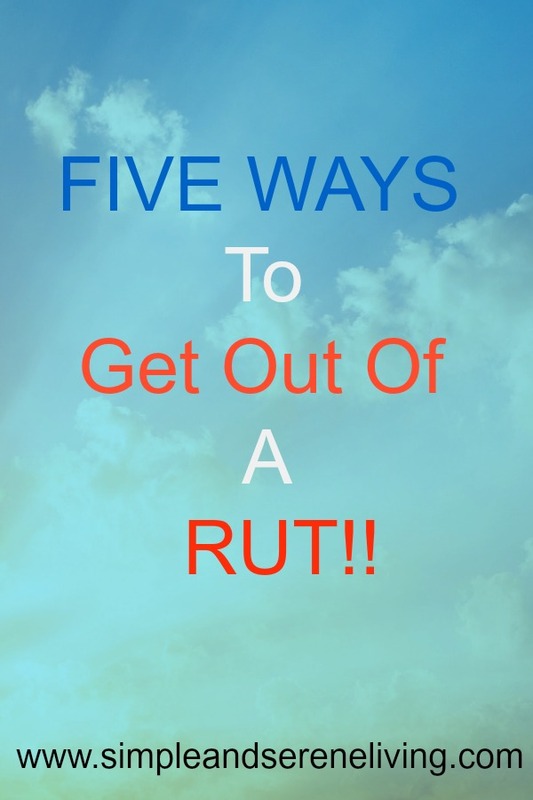 I have also been writing down ways to get out of that rut and thought maybe you would find those ways useful too. 1) Write down the changes you want to make in your life. How do you see yourself a month from now? a year from now? five years from now? Where do you want to be? What do you want to be doing? Is there someone you would like to be with? 3) Recognize that it is time to move on. We often get stuck in a rut because we are afraid to move on. We get comfortable in our old slippers and the thought of putting on a new pair scares us. It is important to recognize if you have become complacent, because things are really wonderful or because you don't want to face changes. In this instance setting goals can be helpful. Start small and work up to what you really want to see happen in your life. 4) Recognize your roadblocks and how to get around them. We all put up roadblocks in our lives. We see them as keeping us from danger, but often they keep us from moving on, from making positive changes in our lives. Once you recognize the roadblocks you have set up, think of ways you can get around them. What are some things you can do differently to reach the destination you want? 5) Take a look at your feelings. Often it is our feelings that are holding us back. Depression and anxiety can keep us in a rut. If you are feeling depressed or anxious, try to look at what is bothering you from a new perspective. Know that you are never alone in your feelings, and if you are unable to overcome these feelings on your own then seek out a professional to help you overcome them. Life has so much to offer all of us. Everyone deserves happiness. Don't let being in a rut keep you from that happiness. I know that I am going to keep working hard to get out of my rut. What would you like to see change in your life and how will you go about making that change? P.S. Find more of the Rewriting Life Series here. These are all great ideas, Laura! 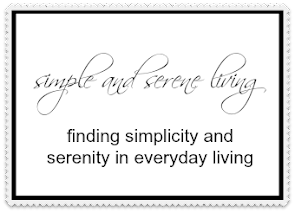 I know that many people are feeling especially stuck in a rut as the holidays approach. Regrets, their current situation, etc. etc. can seem overwhelming. One thing I would add to your list is this: I need to get out in the fresh air daily. Take a walk. Clear my head. For me, feeling and breathing the fresh air is so therapeutic, helping shed those negative feelings. Most of all, knowing that God is still in control of the universe, no matter what my feelings currently are. I try to anchor to that, not to feelings, which are so subjective and fickle. And now, the rut I'd like to get out of is apathy regarding decorating the house for Christmas. With kids gone and grandkids not coming for Christmas, it does seem pointless at times. I need to remember that Christmas is about celebrating the birth of Christ, not about having a ton of family around me. Therefore, I just might go upstairs now and drag down those boxes and get to work. LOL Have a wonderful day, Laura. That is a great idea, Judy. I love getting out in the fresh air when I need to clear my head. I was just thinking the same thing about the Christmas decorations this morning. I need to start pulling those boxes out too. Thanks for the suggestions. These are all wonderful, Laura. # 5 is so true!!! A lot of good advice and I like the questions in #1. However, I don't have the answers to these questions - that's the problem! Lots to think about, especially with the New Year coming up. I keep a journal, Melanie where I write down bits and pieces. I don't really have all the answers either, but when I look back at all of the little things I write down it helps me to pull it all together. Laura...your posts always inspire me and I trust your thoughts and advice. Moving on is a life saver, for me at least. I reached a really low point in my life several years ago and fell into a rut of staying in my PJ's all day, rarely wearing makeup or going out except for the basic errands. Finally I picked myself up, dusted myself off and got in gear. Self respect. It worked. Anything comfortable is good but not a means to an end. Facing your emotions is difficult. I get too worked up talking about my innermost feelings so I journal. Then I close the book. Done! Thank you, again...I love your posts! I am so happy to know that you find them helpful, Jane. I respect you so much for pushing through your feelings and moving forward. That takes a lot of courage. I love to journal too. Great ideas, Laura! I agree with Cranberry Morning - it always helps me to get out in the fresh air!! Those are simple, but great ideas. It's so easy to be stuck in a pattern of thoughts. Such great tips and you have helped us all by organizing where to begin. I think most of us never thought that as we age we would be faced with such challenges. I remember looking at older people when I was younger and thinking how nice it must be to have no problems or worries! Boy, was I wrong! Thank you for these tips to help get us back on track!